If you’re looking for a Long Island Sound fishing charter, you’ve come to the right place. Salt Addict Fishing Charters offers full day fishing, half day fishing, night fishing and sunset cruises. 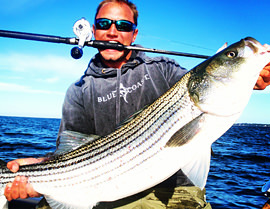 Operating from the Captain’s Cove Seaport in Bridgeport, Connecticut, Salt Addict Fishing Charters is located in one of the best fishing locations in the north east. Striped Bass, Bluefish, Summer Flounder, Scup, Black Sea Bass, Tautog and more! Salt Addict Fishing Charters is the Long Island Sound fishing guide that offers a great day of fun and fishing. Call or contact Capt. Tyler today to set up your next charter fishing adventure. We’ll get back with you shortly to confirm your booking, make payment arrangements and go over any other details. Please select a preferred booking date. List alternate dates in the “Comments” section. Read this & all the latest reports!